THE GODFATHER: "The Godfather remains a very solid piece of work that succeeds on almost all levels.."
THE GODFATHER PART II: "The film richly deserves its status as a classic, and it may well be the best film of the three." THE GODFATHER PART III: "While not a bad film per se, The Godfather Part III really doesn’t deserve to be mentioned in the same breath as its two predecessors." 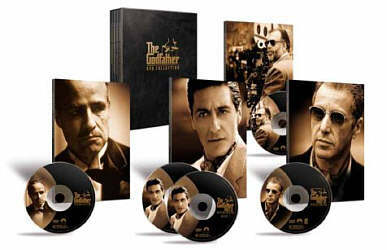 It took a while to arrive, but Paramount eventually put out “The Godfather DVD Collection”, undoubtedly the studio’s most elaborate product when it was released. Was it worth the wait? In terms of the presentation of the movies, I’d say no; these prominent flicks shouldn’t look and sound as bad as they do here. However, the set excelled in terms of supplements, the focus of this review. For full information on the individual movies, please consult my separate reviews of 1972’s The Godfather, 1974’s The Godfather Part II, and 1990’s The Godfather Part III. Please note that the picture and sound grades found at the top of this article represent an average for the three movies. Please check out the full reviews to get the details. Though this article covers the boxed set as a whole, I want to concentrate mainly on the package’s fifth DVD. 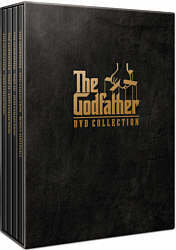 Called simply “Bonus Materials”, this disc includes a wealth of Godfather information. All of DVD Five’s pieces appear in different domains. We begin with “Behind the Scenes”, where we get a mix of video programs. 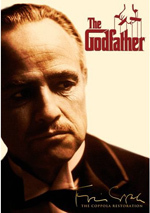 Most significant of these is The Godfather Family: A Look Inside, a documentary about the trilogy. 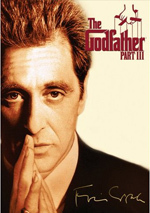 Created to accompany The Godfather Part III, this 1991 program runs 73 minutes and 20 seconds. It includes clips from all three films, footage from the various sets, and interview snippets with a mix of participants, most of which appear to have been recorded during the filming of Part III. Although I found this to be a generally interesting documentary, the focus on Part III made it less effective. 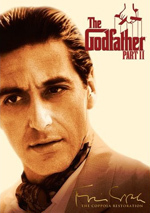 Roughly the first half of the program explored the genesis of the series and discussed Godfather and Part II. This was where the best material resided. We saw parts of Marlon Brando’s original makeup test as Vito Corleone, Pacino’s auditions, and even tryouts for others; we got to watch De Niro go for the role as Sonny, and both James Caan and Martin Sheet attempt Michael! All of this was fascinating to see, although it went by far too quickly. Additionally, interviews added to the discussion of the first two films, and these provided some good information. Really, most of this material stuck with Godfather, and even then we heard mostly about the casting. Most of the show’s second half dealt with Part III. Occasional tidbits about the other movies cropped up, and the program could be rather disjointed as it leapt between eras. Admittedly, some of the information about Part III was interesting, and I enjoyed a lot of the shots from the set; a scene in which Garcia really chomps at Mantegna’s ear is terrific. However, the concentration on Part III felt fairly superficial, and the program seemed like it mainly intended to promote that film. We didn’t get a lot of insight into it, and the preponderance of film clips became tiresome. Overall, “A Look Inside” had some good moments, but it failed to become a truly engaging and informative piece. Next we found On Location, a six minute and 55 second featurette that followed production designer Dean Tavoularis as he revisited the original shooting settings. It’s moderately fun to get an updated look at these locales and to hear about how the areas were changed for the movie. The program also included some documentary footage shot for Part II, which added a nice layer of depth to the piece; it’s too bad more of this material didn’t make the DVD. Francis Coppola’s Notebook offered a very compelling discussion of the director’s preparation for the first movie. He took the Mario Puzo novel and extensively annotated it. During this 10 minute and 10 second program, Coppola goes through the notebook and mentions many of his comments. The piece particularly focuses on the scene in which Michael kills Sollozzo and the police captain, with additional information about the violence aimed at Apollonia and Vito. It’s a terrific little featurette that provided some great information. The Music of The Godfather gave us some notes about the two composers involved in the series. The section about Nino Rota comes from an audiotape Coppola made of a January 1972 meeting between the two men. We hear demo versions of many Godfather themes as well as some remarks from Rota and Coppola during this cool five and a half minute snippet. This was one place we could check out the unused “Going to Los Angeles” music discussed during Coppola’s audio commentary for Godfather. Another area talks about Carmine Coppola. In the three minute and 15 second piece, we see shots from a November 1990 scoring session conducted by Carmine, and we also hear comments from him and director son Francis. It’s a superficial piece but I thought it was mildly interesting. Coppola and Puzo On Screenwriting offered exactly what the title implied. During this eight minute and five second program, we find more Part III vintage interviews with Francis Ford Coppola and Mario Puzo, and they went through issues dealt with for all three movies. It’s a good discussion of the general concerns, and I was very interested to hear Puzo’s idea for Godfather IV. During Gordon Willis On Cinematography, we got some insight into his photographic techniques for the three films. In addition to his comments - which included an admission that he may have made some parts of Part II too dark - we heard from fellow cinematographers Michael Chapman, Conrad Hall, and William A. Fraker in this three minute and 45 second featurette. Despite its brevity, I found this to be a very compelling little piece. Two separate sections provided looks at Storyboards. For The Godfather Part II, we found a stillframe presentation that covered 24 boards, mainly from the scene in which Vito murders Fanucci. The boards from The Godfather Part III used more of an animatic format; a narrator described the filmed action, and some others acted out the parts during this four minute and 25 second piece. It’s an interesting way to check out the material, which covered three different scenes but mainly focused on the break-in at Vincent’s apartment. Lastly, we found The Godfather Behind the Scenes 1971. This eight-minute and 55-second program offered a puff piece similar to the promotional featurettes that accompany modern films. However, it did provide short interview snippets with a few performers who usually don’t make the cut; in addition to big names Caan and Pacino, we heard from Al Martino, Morgana King and Richard Castellano. One cool aspect of the “Behind the Scenes” area: if you let the menus run, you’ll hear what appear to be outtakes from Godfather rehearsals. These concentrate on the preparations for Michael’s restaurant killing, and they’re a lot of fun. Click on them more than once, as different snippets pop up at various times; I’ve heard at least four, and there may be more. The next big area of the DVD is the Added Scenes department. There we find a whopping 34 unused snippets from all three of the movies, though Part III only includes one piece; its video version features extra footage reintegrated, so there was less to provide here. The different clips run between 20 seconds and six minutes, 40 seconds for a total of 55 minutes and 37 seconds of material. All of the pieces appear in fullscreen except for the final one, which comes from Part III; it’s non-anamorphic letterboxed. Each scene starts with a text introduction that tells us a little about the segment and places it within the films’ continuity. Although the vast majority of the clips are quite short, they’re fascinating to see. Actually, many have already been viewed because they appeared during TV versions of the first two films. In any case, almost none are crucial material, but considering the stature of the movies, it’s a delight to check them out, and they’re consistently interesting. I thought very few belonged in the film, but I also believed that almost none of them would have been inappropriate. Personally, I’d argue that the Godfather II footage that follows Michael’s pursuit of Fabrizio - Apollonia’s killer from the first film - should have made the cut, but I’m very glad they omitted some shots of Kay as she lights candles for Michael’s soul. Otherwise, I could go either way with the rest of the clips. They clearly weren’t necessary, but they would have been interesting additions nonetheless. I appreciated the inclusion of the text to set up all of the clips, though I found it irritating that I couldn’t skip this material; if I want to watch the scenes again, I still have to sit through a few seconds of print. This is a minor complaint, but I must admit that I hate it when DVDs won’t let me skip menus or other pieces. When we move to the Filmmakers department, we encounter decent text biographies for some key participants. There are listings for Coppola, Puzo, Willis, Tavoularis, Rota, and Carmine Coppola. One nice touch: click on the filmmaker’s name at the top of each screen and you can link to the appropriate featurettes that appear in the “Behind the Scenes” area. The Family Tree offers additional fun text material. We get short biographies for a slew of characters. These radiate out from the main Corleones: Vito, Michael, Sonny, Connie, and Fredo as well as Tom Hagen. From there we find information about those characters as well as spouses and children. The entries are short but sufficient and interesting. A little sloppiness appears, such as conflicting dates for Carlo’s death; the main page says 1954, while the full text mentions 1955. Nonetheless, this is a cool little extra. In addition, the “Family Tree” provides biographies for many of the actors. If you click on their portraits at the top of the pages, you can access text similar to that offered for the filmmakers. Again, these are brief listings, but they add some depth to the proceedings and are a nice touch. In the “Galleries” area, we find a few sections. There’s a Photo Gallery that includes 106 stills. These offer a nice mix of publicity shots and behind the scenes images. In addition, we get a Rogues’ Gallery. An odd choice, this one shows 10 publicity shots of some of the trilogy’s bad guys. The “Photo Gallery” is much more interesting, but I didn’t mind the addition to the other set as well. We see Trailers for all three of the movies. We get one per film. The clip for The Godfather was surprisingly bad; it provided just a series of stills and offered a slew of spoilers. The Part II piece came after the Oscars. Actually, it was unclear if this was one long trailer or two; I think it was just one, but it seemed hard to tell. The Acclaim and Response part of the “Galleries” adds some additional interesting pieces. There we find a listing of some of the Oscars won by the films: it charts the Best Screenplay and Best Picture victories for The Godfather as well as the Best Director and Best Picture triumphs for II. However, these aren’t just mentioned in text; if you click on them, you’ll find the appropriate excerpts from the awards ceremony. It’s too bad the infamous acceptance of Brando’s award by “Sacheen Littlefeather” - an actress who pretended to be a Native American - didn’t appear, but I thought this was a very cool touch nonetheless. In addition, we get a 95-second 1974 Network TV Introduction. This preceded the first television showing of The Godfather and showed Coppola at work on Part II as he explained some modifications made to the first film to allow it to appear on network TV. It’s a fun piece of history that I enjoyed. Lastly, this area adds a traditional text listing of Awards and Nominations. Also in the “Galleries” department are the DVD Credits. In addition to text that lets us know the people behind this fine package, we find one of the coolest “Easter eggs” I’ve seen. I’ll leave it a surprise, but you’ll definitely want to click through all of the text screens to find it. When I gave “The Godfather DVD Collection” its “extras” grade, I also considered the supplements found on the movie discs themselves. While the bulk of the materials appeared on the fifth DVD, each film included an audio commentary from director Francis Ford Coppola. Overall, these were strong pieces; please consult the individual film reviews for more information about those tracks. The Godfather boxed set isn’t the slam-dunk I’d hoped it to be. The extras included in the package could have helped to make this a special set. From three separate audio commentaries to a documentary to nearly an hour of deleted scenes to a mix of other materials, there’s a wealth of Godfather information in this box, and most of it seemed very good. Unfortunately, the movies themselves looked and sounded mediocre to bad. Films as noted as these deserved better.